For more information, see my disclosures, here. Hi Friends! With Thanksgiving behind us, I am now in full on Christmas mode and I could not be happier. This is my absolute favorite time of year! I love it all…the true meaning of Christmas, the decorations, the music, the food, and the all-around magic of the season. Today, I am absolutely thrilled to share my Deck the Halls Tree Trimming Holiday Party in partnership with Coca-Cola® and Walmart with all of you! This party is such a fun kick-off to the holiday season—an evening of cheer, for it’s tree trimming time of year! The holidays are all about joy and gathering with good food and drink, friends and family. But the holidays can also be a very busy time with lots to do! Why not host a Tree Trimming Holiday Party so you can beautifully decorate your tree while also celebrating the season with family and friends?! A total win-win! 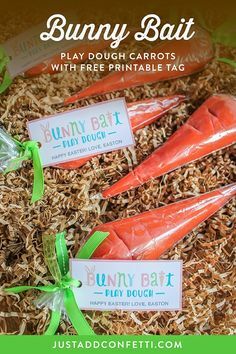 I’ve got you covered with some of my family’s favorite recipes, a bunch of free party printables, and lots of great inspiration and ideas. For even more Holiday recipes and inspiration, click here. With all of the tree trimming and ribbon and ornament stringing, you will certainly need some tasty refreshments and foods for your guests to enjoy. I have some tried and true family favorite recipes to share with you all…Pesto and Sun-Dried Tomato Gorgonzola Loaf, Sweet and Spicy Coca-Cola® Kielbasa, and a Charcuterie Board. But first, let’s start with a delicious Cranberry Vanilla Coke-tail recipe that is a super simple way to mix up a party favorite. Let’s be honest, Coca-Cola® is pretty much synonymous with the holiday season. It’s everyone’s favorite, and sure to bring the magic of the season to life, one glass at a time. This recipe is so easy! I’ve listed it below—all you need is Coca-Cola® or Coca-Cola® Zero Sugar, Simply® Cranberry Cocktail and Imitation Vanilla Flavoring. I was able to grab the 2-liter of Coca-Cola® and Simply® Cranberry at Walmart when I was picking up the other food items and supplies for the party. It was so convenient! Who doesn’t love one-stop shopping during the busy holiday season! 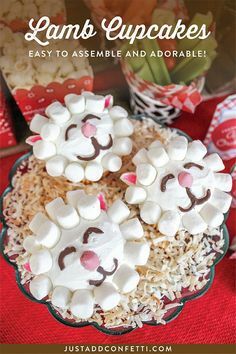 A simple way to mix up a party favorite that everyone will love! Fill a glass ¾ of the way with Coca-Cola® or Coca-Cola® Zero Sugar. Ok friends, do yourself a favor and add this to your “must make” list now. This Pesto and Sun-dried Tomato Gorgonzola Loaf is hands-down the most popular recipe in my family. The flavor combination is just so delicious. It wouldn’t be the holidays without it! Also, to add to your festive holiday table, you can cut the top two corners off of the loaf to make it into a tree shape. A Charcuterie Board (pronounced shahr-koo-tuh-ree) is a great addition to any party. All meats, cheeses, fruits and nuts are fair game for this type of display. 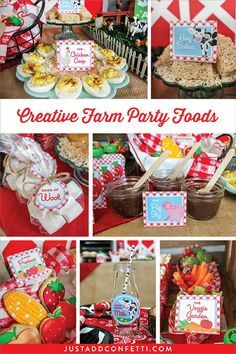 I love it for a party, too, because there is a little bit of a lot of things so you are bound to have options that will appeal to all of your guests. Variety is key—in terms of color, texture and flavor. On this charcuterie board, I combined peppered salami, pepperoni, prosciutto, cheeses (mozzarella, sharp cheddar, rosemary herb, and pepperjack), walnuts, almonds, peppers, olives, grapes, figs, clementines and raspberries (and sprigs of rosemary for garnish). Have fun with your presentation! I loved displaying the olives in a hollowed green bell pepper. It worked so well! Also, any food safe wooden board would work well for the display. I loved the look of the unfinished board that I used, so I just made sure to cover it with parchment paper before I started layering any of the foods onto it. This Sweet and Spicy Coca-Cola® Kielbasa is another family favorite. It’s so yummy and easy too—only requiring 4 ingredients! This sweet and spicy Kielbasa recipe is so easy and delicious. It only requires 4 ingredients. Simmered in Coca-Cola®, it's bound to become an instant favorite! Simmer on stovetop for 1 hour. Serve warm. When I was first envisioning this party I knew I wanted the color palette to be festive and fun…featuring lots of white, red, green, and gold with natural elements interwoven throughout. I loved the idea of natural wood slabs as serving platters and a garland hanging above the tablescape. Of course a tree trimming party wouldn’t be complete without ribbons, garlands, and baskets brimming with ornaments ready to be put on the tree. I incorporated these at the base of the tree as well as on the table itself. In thinking about the graphic designed elements of the party, I knew I wanted the style to be timeless “Classic Christmas.” All of the designs are available as free printables at the bottom of this post. I hope you can use them for your tree trimming celebrations this season! Lastly, you can’t send your guests home empty-handed…it’s Christmas after all! Coca-Cola® is a perfect gift for everyone on your list. Send your guests home with a bottle so they can make their own Cranberry Vanilla Coke-tails! Also, since all of your guests will be helping you trim your tree, I thought it would be fun to create a DIY ornament that they could use to trim theirs at home. These Apple Cinnamon ornaments are another family tradition in our house. I remember making them as a child and now I love making them with my own kids. (This post is just full of family favorites and nostalgia for me! I love it! haha!) Below is the full step-by-step tutorial to make these sweet ornaments. To smooth dough even more, place a second sheet of parchment paper on top of dough and roll out with rolling pin. Using cookie cutters of your choice, start cutting out shapes for your ornaments. Place ornaments on a parchment-lined cookie sheet. Using a straw, poke a hole in the top of each ornament. Bake in a 200 degree oven for 2.5 hours. Allow ornaments to cool completely on a wire rack. Once cooled, thread a ribbon through the hole in the top of the ornament. Then, decorate with white puff paint, glitter or paint of your choice. I hope this Deck the Halls Tree Trimming Holiday Party has inspired you to create your own festive tree trimming gathering. If so, I’d love to see it! Please follow along on Instagram and tag me using the #justaddconfettiprintables hashtag. I love connecting with all of you and seeing your awesome celebrations! For even more holiday inspiration and recipes, check out these other great ideas! 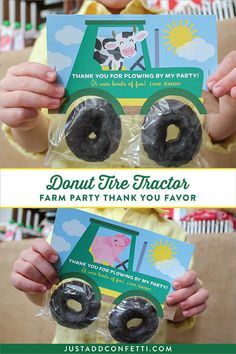 The invitation and thank you tag free printables are PDF files that contains editable fields (for the names). 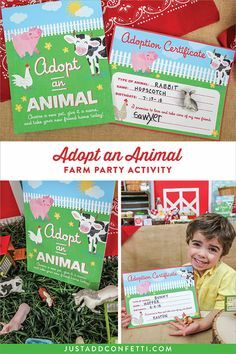 To personalize these printable pages, just open the PDF in Adobe Reader, click where it currently says “Merry Christmas! The McKowns”, and type the message you would like to include. Repeat for the invitation with the wording and event information you would like to include. Then just click “save” and print. If you don’t have Adobe Reader you can download it for free here. The large backdrop printable graphic is 48×36 inches and is sized to be printed on this size paper. 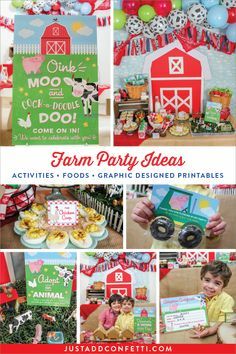 All of the printables from this party are available for free in the printable library!